“Cheryl R. Riley's art is concerned with similarities between seemingly disparate cultures through the lens of memory, history, iconography, rituals, attire, implements and symbols. She is currently working on two sculpture series dealing with aspiration, transcendence, staging and representation. Cheryl's involvement with the art world is wide-ranging and long-standing. Her public art projects are installed in San Francisco, Sacramento, Atlanta and New York. With artworks in the collections of connoisseurs as well as museums, including the Smithsonian and SFMoMA, she is a National Endowment for the Arts (NEA) Individual Artist and Vermont Studio Center Civil Society Institute Fellowship Residency grant recipient and James Weldon Johnson Foundation Fellow at Bard College at Simon's Rock. Her next solo exhibit will be May-July 2018 at Aljira Gallery in Newark, New Jersey. 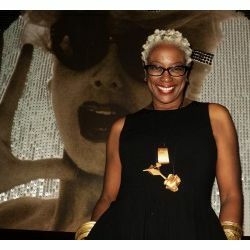 Cheryl teaches and lectures at top art and design schools nationally. She served on the executive committees of museum and non-profit boards, as well as stints with grant-maker selection committees.